In this special report, The Daily Transcript and the Institute for Real Estate Management (IREM) explore current economic trends in commercial real estate and provide a forecast of our economy. We'll also provide an inside look at what IREM has to offer local real estate professionals today. Shifts that will impact the real estate industry over the next decade, according to Christopher Lee, author of "Leading a Real Estate Company: Winning Strategies for the Next Decade," include a shift from historical precedents to innovation. Did you know that approximately 75 percent of small multifamily loans are overlooked by traditional lenders? Once considered too cumbersome and time-consuming to deal with, Imperial Capital Express (a division of La Jolla-headquartered Imperial Capital Bank) has developed a proprietary, streamlined process to meet and serve this important market. Slow job growth. High oil prices. Softening consumer confidence. November ballot initiatives -- these and other issues are swirling around. There is no question that there is a lot of uncertainty out there. Yet, the numbers on the Los Angeles area economy have been slowly improving. San Diego County's high-tech and biotech companies tend to cluster together geographically, but their workers live throughout the county, a new survey by the San Diego Regional Economic Development Corp. has affirmed. There are many ways to create wealth and, in Southern California, even owning your own home can sure make you feel wealthy. Whether a client's goal is actively building a portfolio or merely maintaining a stable income stream, the asset management function provides information to enable the owner to make appropriate decisions regarding individual properties and/or the portfolio as a whole. "It was April Fools Day in 1990 when I became the executive director of IREM," said Nicole Baker. "But it wasn't a joke on me. It was the best career decision I ever made." 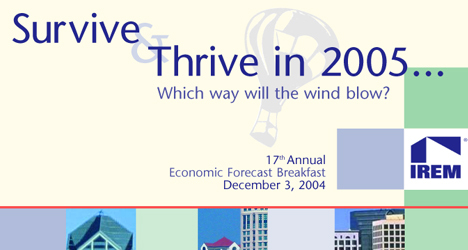 The San Diego Chapter of the Institute of Real Estate Management (IREM) is proud to present their 17th Annual Economic Forecast Breakfast, "Survive & Thrive in 2005." This breakfast will be held Friday, Dec. 3, at the Town & Country Resort & Convention Center, Grand Ballroom, in Mission Valley. It is with great honor and excitement that I begin my term as President of our local Chapter of the Institute of Real Estate Management (IREM). This chapter has enjoyed incredible success, and I intend to continue to build on that success. Relationships have always been the most important things in my life. Since I am an identical twin, I've been in a serious relationship since before I was born! When I became president of the San Diego Chapter of IREM, I declared that the "R" in IREM would stand for relationships. I did that for many reasons, but most significantly because all of our relationships profoundly influence our productivity, our health and our happiness, the "ROI" of our personal and professional lives. Get a sneak peak at San Diego's economic landscape in 2007 through expert opinions, executive forecasts and regional economic indicators.